One of our nearest neighbours, Taiwan’s capital city is less than a 2 hour flight from Hong Kong. There’s lots to see and do, in and around Taipei, and it’s well worth a weekend trip. Editor Brooke Chenoweth jumps on a flight to find exactly how much you can get done in 24 hours. Day One: Plan to arrive early in the morning and head straight to the National Palace Museum, which houses the world’s largest and most valuable collection of Chinese art treasures. Beat the crowds first thing, or visit at lunchtime, when the tourists tend to exit the galleries and hit the cafeteria. Across the street is the lesser known Shung-Ye Museum of Formosan Aborigines where you’ll get a valuable lesson on the history, culture and customs of different tribes in Taiwan. After lunch visit the Martyrs’ Shrine, where you’ll see a fascinating changing of the guard ceremony and a stunning example of classical Ming Dynasty architecture. Check into your hotel then head out again. Grab an early dinner and head to Taipei 101 – Taiwan’s tallest skyscraper. Watch the sunset and enjoy the beautiful night view over Taipei city. It’s not for the faint-hearted and you may feel the building swaying if you stand still too long! The mall downstairs is full of high-end and chain stores, so that’s another option if you don’t make it to the top. Day Two: The following morning, head north to Yeliu Geopark, on the coast – famous for fantastic rock formations sculpted over millions of years by wind, waves, and rain. It’s a popular spot with tourists, but a beautiful one if you ignore the crowds. Continue on to Jiufen, a mountain town with narrow streets lined with old shop houses. Located near the area’s gold mines, the town has a fascinating past and is a mix of Chinese and Japanese influences. Catering for the tourists that descend en masse, every type of Taiwanese snack and delicacy is available here. After tackling the steep stairs take a breather in one of the teahouses and enjoy cool breezes and spectacular views. If you have time, visit the Jiufen Gold Museum – a really interesting place that tells visitors as much about the gold mining history as it does about Japanese occupation during WW2. Both haunting and educational, it’s worth a quick detour. You’ll also pass the beautiful golden waterfall along the way. Return to Taipei city and if you still have the energy be sure to check out some of Taipei’s night markets. The Shilin Night Market is one of the best, and you are guaranteed to leave with a full tummy, a few shopping bags, and a lighter wallet! But Taipei’s oldest, and one its largest, markets is a great way to end your stay. Yeliu Geopark – The guys in the vests are there to stop tourists getting too close to the edge! If you do venture out of Taipei, hire a guide and/or driver, you’ll get more out of the experience, especially if you don’t speak Mandarin. Guides also know the best times to visit certain sites. The Taiwanese are incredibly friendly and helpful though, and navigating the city solo is not unlike travelling around HK. Right next to the National Palace Museum, Silks Palace offers traditional Taiwanese and Cantonese cuisines, based on some of the treasures you’ll find at the museum. The restaurant is also known for its beautiful setting. If you’re after something light, or not, I highly recommend Din Tai Fung, on the ground floor of Taipei 101. It’s open all day but can get very busy (with long queues) at certain times of day. I had an early dinner (4pm) but it meant I didn’t have to wait for a table or service and ate in relative peace. I also ordered enough of everything that I had leftovers for later. Also worth watching the cooks making the dumplings from scratch in the kitchen – they make thousands every day! Street food is everywhere, and it’s generally very good! As a vegetarian I found eating in Taipei unnerving, not being able to read Chinese didn’t help either. It takes courage or well-translated English menus to eat comfortably in Taipei, and a bit of research beforehand won’t go astray! Taipei has its fair share of very nice hotels, particularly those in the Zhongshan and Da’an districts. 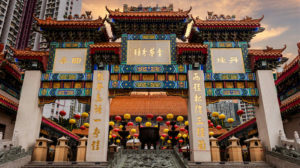 If you’re looking for a deal the Regent Taipei is offering a Silks Palace Cultural Room Package which includes one night stay in an exclusive Taipan Deluxe Room, two sumptuous buffet breakfasts at Brasserie, two tickets to the National Palace Museum, two National Treasure Feast dinner sets at Silks Palace and shuttle services between the hotel and the museum. This comprehensive package is available at NT$12,000 (HKD2,800) for two people.